There’s no doubt that the Smoky Mountains are the perfect place to take your family on vacation this year. From the beautiful hiking and mountain views, to the fun shopping and dining in Gatlinburg TN, the Smokies have it all! The only thing left is to choose your Great Smoky Mountain cabin rental, and we have plenty of tips to help you pick the right one to suit all your vacation needs! The first step to choosing the perfect Great Smoky Mountain cabin rental is to decide how many bedrooms you’re going to need. Are you planning a large family reunion or a vacation for a group of friends? If so, you’ll want to consider one of our larger cabins with plenty of space for everyone to have plenty of privacy. If you’re planning a trip for your small family, a 2 or 3 bedroom cabin will be just big enough for your kids to have some room of their own but not so large that you’ll go all weekend without seeing them! And if you’re planning a romantic retreat for just you and your significant other, our cozy 1 bedroom cabins will be just right. 2. Will You be Bringing Your Pets? Many people don’t realize that bringing Fido along on the family vacation is even an option, but when you choose a Great Smoky Mountain cabin rental from Aunt Bug’s, you will have a variety of pet friendly cabins to choose from! There are many perks to bringing your pup along for the fun. For one, your kids will love having their best friend around to share in the adventure! Secondly, your dog will get lots of healthy exercise playing in his new surroundings. And last but definitely not least, you will save tons of money on boarding costs! That extra money will stretch your ‘fun budget’ even further! Another helpful tip for choosing the perfect Great Smoky Mountain cabin rental is to talk with your family or friends and decide which amenities you can’t live without during your vacation. If you are heading to the mountains to enjoy all things outdoors, you’ll want to choose a cabin with breathtaking mountain views and an outdoor fire pit to enjoy during the cool evenings. If you’re looking for a weekend of total rest and relaxation, our cabins with theater rooms and game rooms are guaranteed to provide you with hours of non-stop fun. 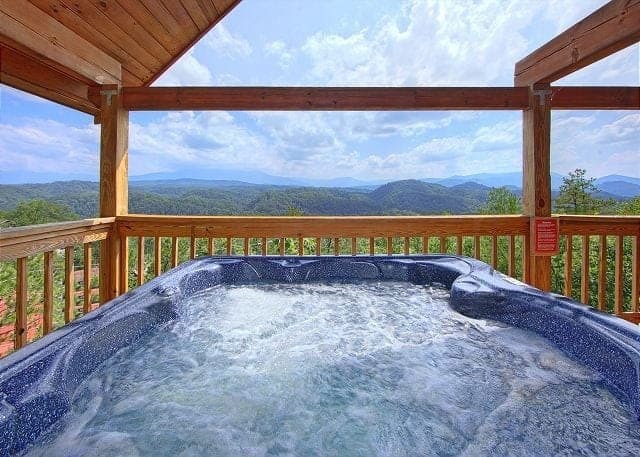 And no vacation in the mountains is complete without a private hot tub to soak in all the gorgeous views! No matter how you want to spend your vacation, we have the perfect cabin for you! One of the most important things to consider when choosing your Great Smoky Mountain cabin rental is your budget. Sticking to the budget that you’ve made for your vacation is important because you want to be able to see the sights, explore the city and enjoy some delicious restaurants, so we have made sure to have plenty of affordable cabins for you to choose from! If your kids are always playing together and are likely to fall asleep in the same room, consider choosing a 2 bedroom cabin and letting them all bunk together! There’s no need for everyone to have their own room if they are happy spending the weekend hanging out! If you want the experience of an extra large cabin, invite a few friends or another family with children. Your kids will love having more friends to play with, and this will let you enjoy the experience of a big cabin while sharing the cost of the stay with 1 or 2 other people! Don’t wait! Choose your perfect Great Smoky Mountain cabin rental, and start planning your vacation today!